Canon offers the Rebel T3i with the EF-S 18-135mm IS Zoom as a step-up to the shorter 18-55mm lens (it's an actual kit at a special price). Aside from the extended telephoto range, is it worth spending an extra $250 for this upgrade? If you want a single lens that ranges from an effective 29mm to 216mm range, non-rotating front objective lens (better for polarizing filters), and metal lens mount, then you might be tempted by this upgrade. But if you're looking for a bump in image quality over the 18-55mm kit lens, then hang on to your wallet: the two lenses are about the same in terms of sharpness and distortion control. Now that isn't necessarily bad news, since both the 18-55mm and 18-135mm are solid performers. 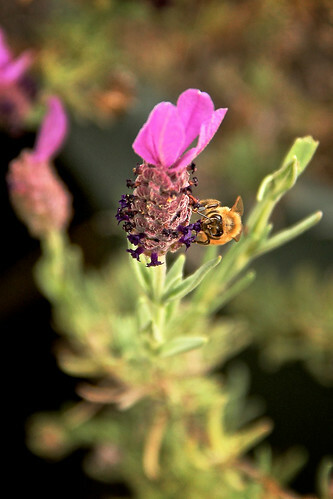 "Bee on Lavender" photographed with a Rebel T3i and 18-135mm EF-S zoom at 135mm wide open (f/5.6). ISO 500, 1/250th second. The Jpeg image was first processed in Aperture 3, with a bit of additional sharpening in Photoshop CS5. Click on image for larger version. Photo by Derrick Story. I've been testing the the 18-135mm on a Canon EOS Rebel T3i, and have enjoyed using it. Even though it's a bigger lens and does weigh more than the 18-55mm, it feels good on the Rebel body. And I liked not having to change lenses as often as I had previously with the shorter kit lens. 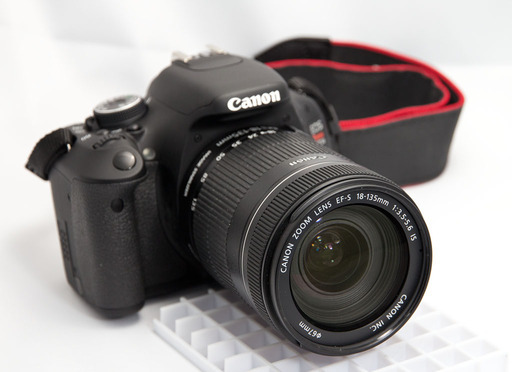 Canon EF-S 18-135mm IS Zoom Lens mounted on a EOS Rebel T3i. Click on image for larger size. Photo by Derrick Story. If you want to go to the next level of image quality, however, I recommend the EF-S 15-85mm zoom that has a wider angle of view, quiet USM focusing motor, better build, and better sharpness, especially on the corners. However, this zoom costs about 3X more ($795) because it isn't a kit option, and doesn't have the same reach as the 18-135mm. So, for essentially $250 (when purchased as part of a kit), the 18-135mm is a very good deal. (Keep in mind if you buy the 18-135mm separately, it's about $650.) And after shooting with it for a few weeks, I would have a hard time going back to the shorter 18-55mm kit zoom. I'd consider the upgrade if you're looking at the new Rebels.